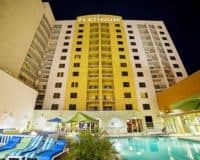 The SpringHill Suites by Marriott, 2989 Paradise Road, is a luxury hotel, perfectly located close to the Las Vegas Convention Center. 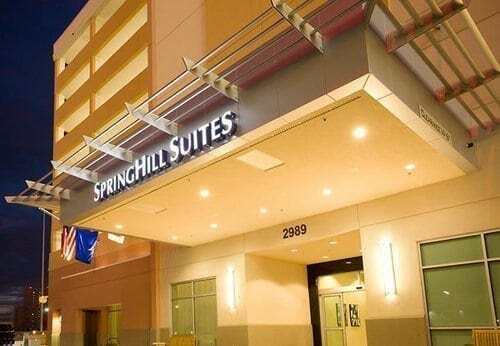 The SpringHill Suites by Marriott, is a luxury hotel, perfectly located close to the Las Vegas Convention Center. This makes it ideal for anyone in town on business, although the quality of the rooms and other amenities makes it a good choice for pleasure seekers too. The hotel offers a good range of amenities including a state-of-the-art gym, where you can maintain your usual fitness regime; a seasonal outdoor pool, where you can go for a refreshing dip, during the sweltering Las Vegas summers and gaze out across the bright lights of the city; free parking for those who bring their own vehicle and easily accessible WIFI that can be found throughout the property. The hotel also provides a bar and bistro where you can entertain clients or having a satisfying drink after a hard day’s work. The accommodation is spacious and modern, with each suite offering kitchen facilities that are perfect for anyone who plans to pack a lot into their Vegas stay, plenty of space to work and dock electrical equipment, satellite equipped televisions, which allow you to relax; alongside all the usual things that you get in good hotels like clean bathrooms and comfortable beds. 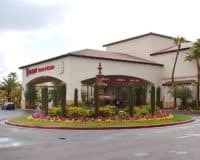 This makes the SpringHill Suites by Marriott Las Vegas Convention Center, ideal for business people who want to make the most out of their Las Vegas stay, and the friendly staff will do everything they can to enable you to do exactly this. While pleasure seekers, who want to have fun in a professional setting will also enjoy what the hotel has to offer. Within 3 mi (5 km) of the University of Nevada-Las Vegas and Las Vegas Premium Outlets.